Vert Cafe in Gyoda Suijo Park captivates the passerby with its atypical European appearance. A beautiful wooden mansion glossed in a light fern green, it is not only aesthetically pleasing, but it has an interesting backstory of its near 100 year history. From what I can tell from the vague accounts on the Gyoda City website, this is not the original site of the building. There are references to it being “relocated” to the current site in Gyoda Suijo park in 2016. Whether it was relocated or just renovated, one thing is very clear: the current building is very different to the dilapidated building it used to be. Vert Cafe started out as a Credit Association, the equivalent of a modern day bank, in 1922. It is officially referred to as “the former Oshimachi Credit Association Store”. The bank was the central investment office for tabi production in Gyoda. Gyoda is the largest tabi producing city in Japan since the 1700s. Another thing that Gyoda is famous for is the Oshi castle ruins and replica building. The castle is renowned for being one of the only castle’s to survive a flood attack. In more recent years, the area is also renowned for its rare lotus park and rice field art, which has night illumination in winter too. Gyoda city and its residents are very proud of their castle town heritage, their tabi and the former Oshi bank. The building has been given the coveted Tangible Cultural Property award of the city. There are other historic buildings with the award, but most can only be viewed from the outside. Vert Cafe is one of only a few that you can actually go into. Since September of last year (2018) the former bank is home to an alluring cafe. Although built in the 1920s it would seem that it was designed on Georgian architecture. The interior keeps with the exterior. The symmetry of the doors and windows, the abundance of the latter which are long and paneled, the high painted ceilings with cornices. 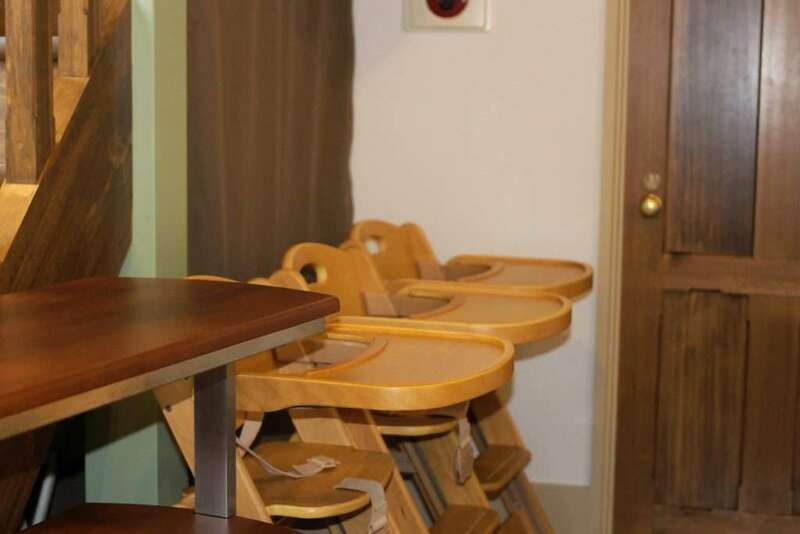 Vert cafe is particularly child friendly with a healthy and reasonably priced kids menu. They even have a small play area downstairs for children. It has a good selection of books. There are some toys and they have a lovely wooden play kitchen. In the room there is a travel cot to lie a baby. Upstairs there is a nursing room and baby diaper changing facilities. The main seating is on an upper floor. There is a stairs, but they request customers use the elevator. The seating is set up as tables for two or four, but they can be moved for a larger group. There is a toilet on this floor and the aforementioned diaper changing and nursing room. Downstairs, beside the kitchen and reception area there is one table for four and a table for two. There is also some counter space with stools. There is also a toilet on this floor. They have high chairs here, but there is also a couple upstairs. The main menu isn’t particularly large, but they have a nice choice of healthy homemade food. And what I love; even their desserts are healthier than most as they substitute cream with tofu. Another thing I love about this cafe is that it is run by Moms hence the child friendliness of the establishment. Located in the Gyoda Suijo Park, the cafe enjoys beautiful views of the park lake. In springtime the park is renowned for its cherry blossoms. They weren’t in bloom today when we visited, but are expected to start over the coming days. There are some tables outside you can use. In fine weather they put up sun umbrellas. Hours: 2 pm to 5 pm every day of the week, from 11 am on Saturdays and Sundays. There are no official holidays, but sometimes the cafe closes early. You can see any notifications of such on the official website linked above. 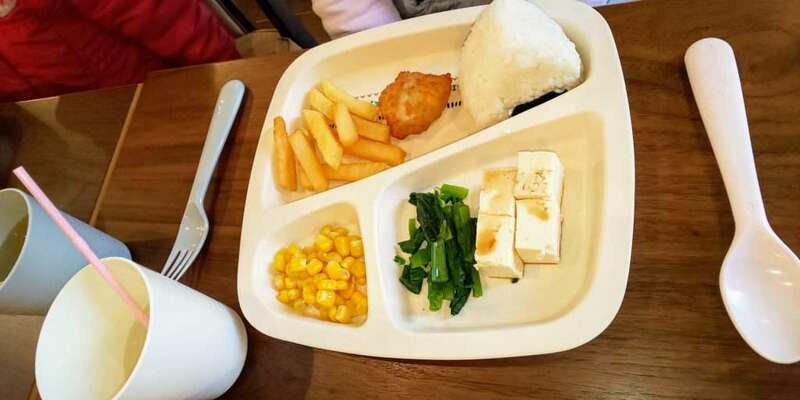 Cost: Kids food starts from as little as 180 yen (2 onigiri) to 480 yen for a kids plate with drink. Adult meals are around 900 yen. The cafe is located close to Suijo Koen bus stop. The nearest station is Gyodashi station on the Chichibu line. It is about a 15 minute walk. Gyoda and Fukiage station on the Takasaki and Ueno-Tokyo shinkansen lines are about 15 minutes by bus. By car the cafe is close to Kumagaya Bypass route 17. There is no official parking, but patrons of the cafe (and the park) can use the car parks of the Gyoda City Shinobu Community Centre and the Gyoda City community center. Both are less than a five minute walk from the cafe.